NASA's Mars 2020 mission, which will look for signs of past life on Mars, will use smart methods originally developed to find the oldest life on Earth, according the mission's Deputy Project Scientist, Dr Ken Williford. The 2020 mission builds on the successes of prior rovers, to make coordinated measurements that could detect signs of ancient life - or biosignatures - in their original spatial context. These techniques, known as "spatially resolved biosignature analysis" derive from geochemical analysis of early life on Earth. "Previous missions to Mars have used a relatively broad brush - analyzing average chemistry over roughly the size of a postage stamp - to "follow the water" and seek ancient habitable environments. 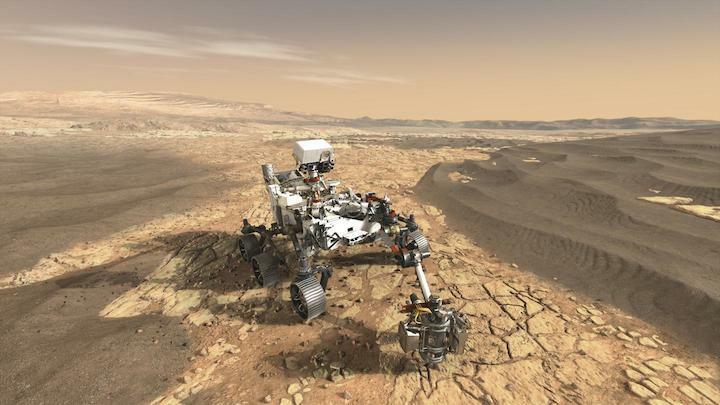 Mars 2020 takes the next natural step in its direct search for evidence of ancient microbial life, focusing measurements to the microbial scale and producing high-resolution maps over similarly postage stamp-sized analytical areas. New scientific methods for searching for the most ancient evidence for life on Earth have led to a leap forward in capabilities for biosignature detection. Rather than using "bulk" geochemistry techniques that measure the average composition of a rock, Mars 2020 is developing new capabilities including X-ray fluorescence and Raman spectroscopy to map the elemental, mineral, and organic composition of rocks at high spatial resolution, with analytical spot sizes about the width of a human hair. Understanding the spatial distribution of chemical features preserved in ancient rocks is key to determining whether or not they were formed by life. Beyond astrobiology, these new techniques enable exploration of the planet Mars at telescopic to microscopic scales - from a mountain to a grain of sand." The instruments in development for Mars 2020 have roots in the search for the earliest signs of life on Earth, as well as life in extreme environments - deep underground, or in hydrothermal settings along ocean-floor ridges. When these methods have been applied on Earth they have enabled scientists to lower limits of detection or to better understand formerly ambiguous observations. In addition, the Mars 2020 mission will use the knowledge gained from its scientific exploration to select and collect key samples that could one day be examined in laboratories back on Earth. Thirty to forty rock and sediment core samples, each about 15 grams, will be hermetically sealed in titanium tubes and deposited in a safe location on the surface of Mars for possible retrieval by a future mission. "Mars 2020 represents a crucial first step towards a possible Mars sample return. Our objective is to collect a diverse set of samples from our landing site with the best potential to preserve records of the evolution of Mars - including the presence of life if it was there. We'll use our onboard instruments to provide the critical field context that future scientists would need to understand the measurements made back on Earth." Dr Williford also discussed the three remaining candidate landing sites for the Mars 2020 mission. One site at Columbia Hills in Gusev crater, was visited previously by the Spirit rover and features silica deposits interpreted by some as analogous to hydrothermal springs known to be inhabited on Earth. The two other sites are located close together on the edge of Isidis Planitia, one of the largest (and oldest) impact craters in the Solar System. Northeast Syrtis features some of the oldest exposed Martian crust with evidence for alteration in the presence of liquid water that leads researchers to believe that this site could have hosted subsurface life. Jezero crater features an ancient river delta and a lake that could have been a prime location for life on early Mars. "We've got some hard decisions in front of us," Williford said. "Because of the possibility of sample return, the selected site could have an outsized impact on the future of Mars science compared to a typical mission. We've been working hard to understand the scientific potential of the different sites and engaging the international scientific community for input on this consequential choice. The team is extremely excited about the opportunity to bring a powerful new payload to the surface of Mars and produce some spectacular results wherever we end up." "It is exciting that now Space agencies realize how studies of early Earth and early life evolution are relevant for the search for life beyond Earth. This NASA MARS 2020 approach of mapping the elemental, mineral, and organic composition of rocks at high spatial resolution with non-destructive techniques is now commonly used on Earth to provide unambiguous evidence for early life in its preserved nanoscale context. The European Space Agency's EXOMARS 2020 mission will also use this methodology". 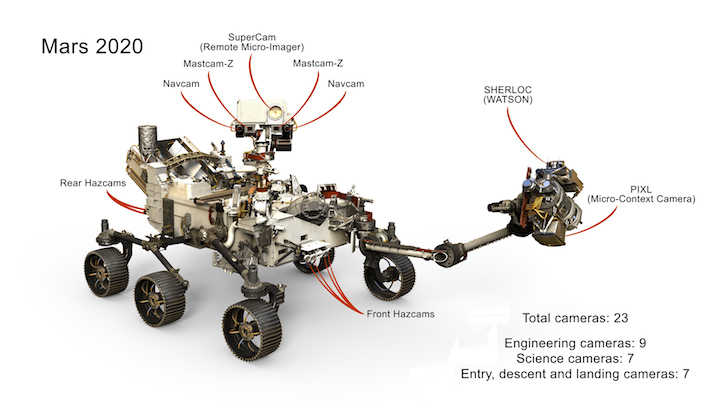 A conceptual image of the Mars 2020 rover is available to journalists from the press office or the link in Notes. › Enhanced Engineering Cameras: Color, higher resolution and wider fields of view than Curiosity's engineering cameras. › Mastcam-Z: An improved version of Curiosity's MASTCAM with a 3:1 zoom lens. 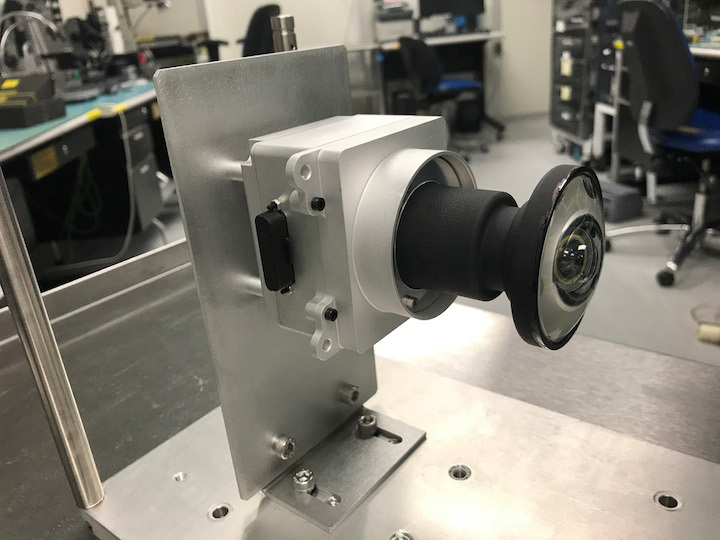 › SuperCam Remote Micro-Imager (RMI): The highest-resolution remote imager will have color, a change from the imager that flew with Curiosity's ChemCam. › CacheCam: Will watch as rock samples are deposited into the rover's body. › Entry, descent and landing cameras: Six cameras will record the entry, descent and landing process, providing the first video of a parachute opening on another planet. › Lander Vision System Camera: Will use computer vision to guide the landing, using a new technology called terrain relative navigation. › SkyCam: A suite of weather instruments will include a sky-facing camera for studying clouds and the atmosphere. NASA tested new “eyes” for its next Mars rover mission on a rocket built by Masten Space Systems in Mojave, California, in 2014, thanks in part to NASA’s Flight Opportunities Program, or FO program. The agency's Jet Propulsion Laboratory in Pasadena, California, is leading development of the Mars 2020 rover’s Lander Vision System, or LVS. The prototype vision system launched 1,066 feet into the air aboard Masten’s rocket-powered “Xombie” test platform and helped guide the rocket to a precise landing at a predesignated target. LVS flew as part of a larger system of experimental landing technologies called the Autonomous Descent and Ascent Powered-flight Testbed, or ADAPT. LVS, a camera-based navigation system, photographs the terrain beneath a descending spacecraft and matches it with onboard maps allowing the craft to detect its location relative to landing hazards such as boulders and outcroppings. The system can then direct the craft toward a safe landing at its primary target site or divert touchdown toward better terrain if there are hazards in the approaching target area. Imaging matching is aided by an inertial measurement unit that monitors orientation. FO program funded the Masten flight tests under the Space Technology Mission Directorate. The program obtains commercial suborbital space launch services to pursue science, technology and engineering to mature technology relevant to NASA's pursuit of space exploration. The program nurtures the emerging suborbital space industry and allows NASA to focus on deep space. An artist’s concept of the 2012 Mars Curiosity Landing. Mars 2020 will use a nearly identical landing system, but with added precision from the Lander Vision System. Andrew Johnson, principal investigator in the Lander Vision System development, said the tests built confidence that the vision system will enable Mars 2020 to land safely. 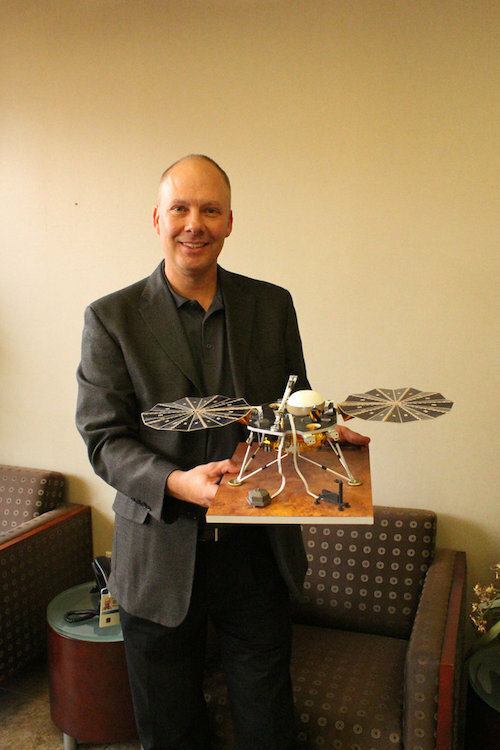 According to “Lander Vision System for Safe and Precise Entry Descent and Landing,” a 2012 abstract co-authored by Johnson for a Mars exploration workshop, LVS enables a broad range of potential landing sites for Mars missions. Typically, Mars landers have lacked the ability to analyze and react to hazards, the abstract says. To avoid hazards, mission planners selected wide-open landing sites with mostly flat terrain. As a result, landers and rovers were limited to areas with relatively limited geological features, and were unable to access many sites of high scientific interest with more complex and hazardous surface morphology. LVS will enable safe landing at these scientifically compelling Mars landing sites. An LVS-equipped mission allows for opportunities to land within more challenging environments and pursue new discoveries about Mars. With LVS baselined for inclusion on Mars 2020, the researchers are now focused on building the flight system ahead of its eventual role on the red planet. Mars 2020 Lander Vision System flight tested aboard a Masten “Xombie” up to 1,066 feet on December 9, 2014 at Mojave Air and Space Port in California. A 58-foot-tall Black Brant IX sounding rocket launches from NASA’s Wallops Flight Facility on Oct. 4. This was the first test of the Mars 2020 mission's parachute-testing series, the Advanced Supersonic Parachute Inflation Research Experiment, or ASPIRE. Landing on Mars is difficult and not always successful. Well-designed advance testing helps. An ambitious NASA Mars rover mission set to launch in 2020 will rely on a special parachute to slow the spacecraft down as it enters the Martian atmosphere at over 12,000 mph (5.4 kilometers per second). Preparations for this mission have provided, for the first time, dramatic video of the parachute opening at supersonic speed. The Mars 2020 mission will seek signs of ancient Martian life by investigating evidence in place and by caching drilled samples of Martian rocks for potential future return to Earth. The mission's parachute-testing series, the Advanced Supersonic Parachute Inflation Research Experiment, or ASPIRE, began with a rocket launch and upper-atmosphere flight last month from the NASA Goddard Space Flight Center's Wallops Flight Facility in Wallops Island, Virginia. "It is quite a ride," said Ian Clark, the test's technical lead from NASA's Jet Propulsion Laboratory in Pasadena, California. "The imagery of our first parachute inflation is almost as breathtaking to behold as it is scientifically significant. For the first time, we get to see what it would look like to be in a spacecraft hurtling towards the Red Planet, unfurling its parachute." 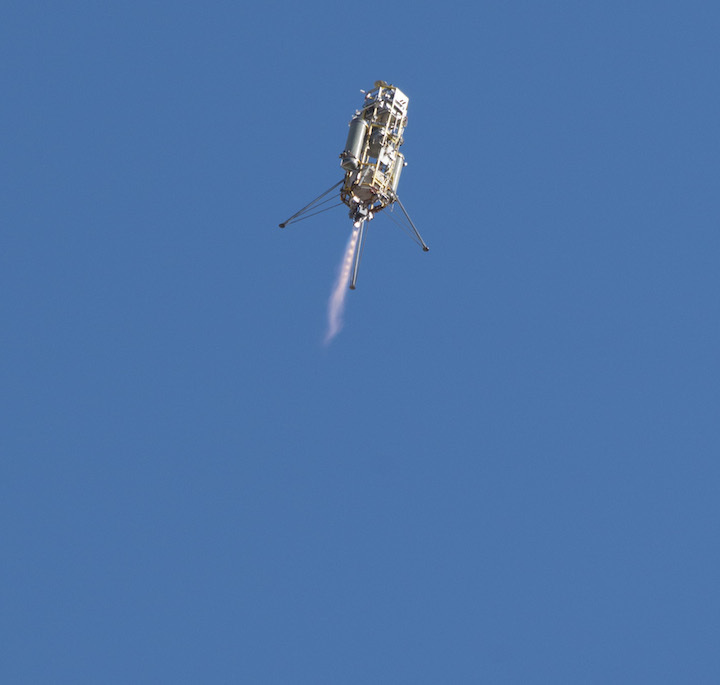 The first flight of an advanced supersonic parachute system for Mars 2020—NASA’s next Mars rover. This video is narrated by Ian Clark, the test's technical lead from NASA's Jet Propulsion Laboratory in Pasadena, California. The test took place on Oct. 4, 2017, at NASA's Wallops Flight Facility, Virginia. At the moment of full inflation, the parachute is going 1.8 times the speed of sound or nearly 1,300 miles an hour, and generating nearly 35,000 pounds of drag force—drag that would be necessary to help slow a payload down as it was entering the Martian atmosphere. This is the first of several tests in support of NASA’s Mars 2020 mission. A 58-foot-tall (17.7-meter) Black Brant IX sounding rocket launched from Wallops on Oct. 4 for this evaluation of the ASPIRE payload performance. The payload is a bullet-nosed, cylindrical structure holding a supersonic parachute, the parachute's deployment mechanism, and the test's high-definition instrumentation -- including cameras -- to record data. The rocket carried the payload as high as about 32 miles (51 kilometers). Forty-two seconds later, at an altitude of 26 miles (42 kilometers) and a velocity of 1.8 times the speed of sound, the test conditions were met and the Mars parachute successfully deployed. Thirty-five minutes after launch, ASPIRE splashed down in the Atlantic Ocean about 34 miles (54 kilometers) southeast of Wallops Island. "Everything went according to plan or better than planned," said Clark. "We not only proved that we could get our payload to the correct altitude and velocity conditions to best mimic a parachute deployment in the Martian atmosphere, but as an added bonus, we got to see our parachute in action as well." The parachute tested during this first flight was almost an exact copy of the parachute used to land NASA's Mars Science Laboratory successfully on the Red Planet in 2012. Future tests will evaluate the performance of a strengthened parachute that could also be used in future Mars missions. The Mars 2020 team will use data from these tests to finalize the design for its mission. The next ASPIRE test is planned for February 2018. In three years, the rocket of the European-Russian ExoMars 2020 mission shall start its nine-month journey to Mars, together with a rover and surface platform. 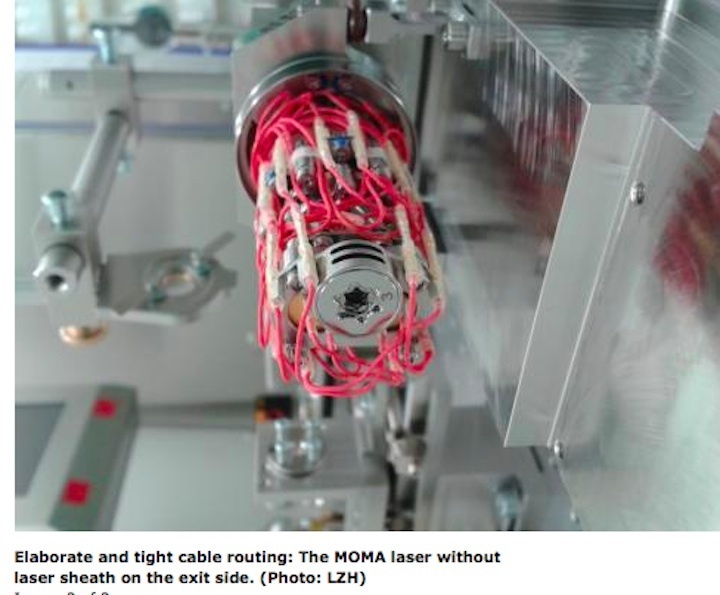 The flight model of the MOMA laser has reached the first milestone: the Laser Zentrum Hannover e.V. LZH has delivered the laser head to the NASA Goddard Space Flight Center, USA. A major goal of the ExoMars mission is to search for past or present life on the Earth-like planet. One of the most important analytical instruments of the EXOMARS rover is the "Mars Organic Molecule Analyzer", MOMA for short. This is being developed together with further partners under the leadership of the Max Planck Institute for Solar System Research (MPS), Göttingen, Germany. 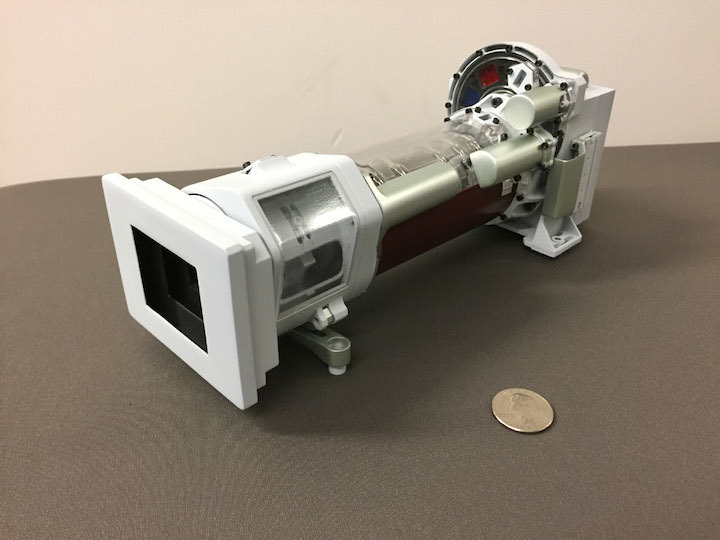 The MOMA laser model, which has been delivered to the NASA Goddard Space Flight Center, is part of the Laser Desorption Mass Spectrometer (LD-MS) developed there. On Mars, it can identify and analyze organic matter. Organic molecules in the soil samples taken in situ could provide clues to possible forms of life. In the past few years, the LZH has developed the diode-pumped solid-state laser head in the UV spectral range required for the investigations. The laser has an emission wavelength of 266 nm and an adjustable laser pulse energy of up to 130 μJ. Its most important unique features, however, are weight, size and robustness. With a length of about 20 cm it has a weight of only about 220 g. In addition, the laser head has to be pretty robust in order to function properly on Mars: Mechanical shocks during the launch of the rocket and during the landing on Mars and very large temperature differences. On the other hand, the laser optics used must withstand both the UV radiation of the laser and the ionizing cosmic radiation. The optics with space-qualified optical coatings were provided by the Laseroptik GmbH and evaluated at the LZH. 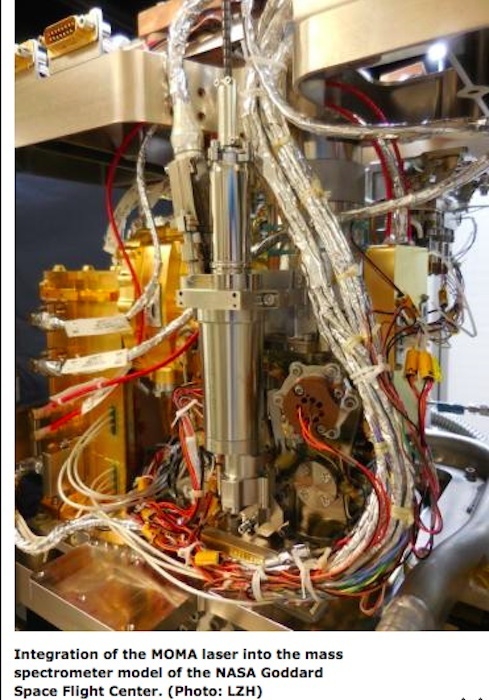 "The laser is optimally adapted to the harsh environmental conditions in space and its mission on Mars," explains Dr. Peter Weßels, Head of the Solid-State Lasers Group at the LZH. "We use a passively Q-switched Nd:YAG oscillator pumped longitudinally over an optical fiber. The infrared light of the oscillator is converted into ultraviolet radiation using nonlinear crystals. A temperature control is to ensure the function even with changing ambient temperature and also allows to flexibly adjust the output pulse energy." Before delivery of the model aircraft to NASA, the laser head was thoroughly tested at the MPS in Göttingen. Currently, it is being integrated into the mass spectrometer at the Goddard Space Flight Center and tested again. It then has to pass environmental tests again with NASA's MS before being re-integrated into the Rover back in Europe. The project is being funded by the Space Agency of the German Aerospace Center with funds from the Federal Ministry of Economics and Technology on the basis of a decision by the German Bundestag under the funding reference numbers 50QX1002 and 50QX1402. In drei Jahren soll sich die Rakete der europäisch-russischen ExoMars 2020 Mission mit Rover und Ober-flächenplattform auf ihren neunmonatigen Weg zum Mars machen. Das Flugmodell des MOMA-Lasers hat das erste Etappenziel erreicht: Das Laser Zentrum Hannover e.V. (LZH) hat den Laserkopf an das NASA Goddard Space Flight Center, USA, ausgeliefert. Ein Hauptziel der ExoMars-Mission ist, nach früherem oder gegenwärtigem Leben auf dem erdähnlichen Planeten zu suchen. Eines der zentralen analytischen Instrumente des EXOMARS-Rovers ist der „Mars Organic Molecule Analyser“, kurz MOMA. Dieses wird unter Führung des Max-Planck-Instituts für Sonnensystemforschung (MPS), Göttingen, mit weiteren Partnern entwickelt. Das nun an das NASA Goddard Space Flight Centerausgelieferte Flugmodell des MOMA-Lasers ist Teil des dort entwickelten Laserdesorptions-Massenspektrometers (LD-MS). Auf dem Mars kann es organische Materie identifizieren und analysieren. Organische Moleküle in den vor Ort genommenen Bodenproben könnten Hinweise auf mögliche Formen von Leben geben. Den für die Untersuchungen benötigten diodengepumpten Festkörperlaserkopf im UV-Spektralbereich hat das LZH in den letzten Jahren entwickelt. Der Laser hat eine Emissionswellenlänge von 266 nm und eine einstellbare Laserpulsenergie von bis zu 130 µJ. Das besondere an ihm sind aber vor allem Gewicht, Größe und seine Robustheit. Mit einer Länge von circa 20 cm bringt er nur etwa 220 g auf die Waage. Zudem muss der Laserkopf einiges aushalten, um unbeschadet seinen Dienst auf dem Mars anzutreten: zum einen mechanische Erschütterungen bei Start der Rakete und Landung auf dem Mars sowie die dort vorherrschenden großen Temperaturunterschiede. Zum anderen müssen die verwendeten Laseroptiken sowohl der UV-Strahlung des Lasers als auch der ionisierenden kosmischen Strahlung widerstehen. Die Optiken wurden dafür von der Laseroptik GmbH mit weltraumfähigen optischen Beschichtungen versehen und am LZH qualifiziert. Vor Auslieferung des Flugmodells an die NASA wurde der Laserkopf beim MPS gründlich getestet. Derzeit wird er am Goddard Space Flight Center vor Ort in das Massenspektrometer (MS) integriert und wiederum getestet. Anschließend muss er zusammen mit dem MS der NASA erneut Umwelttests bestehen, bevor er dann wieder in Europa in den Rover integriert wird. Gefördert wird das Projekt von der Raumfahrt-Agentur des Deutschen Zentrums für Luft- und Raumfahrt e.V. mit Mitteln des Bundesministeriums für Wirtschaft und Technologie aufgrund eines Beschlusses des Deutschen Bundestages unter den Förderkennzeichen 50QX1002 und 50QX1402. Quelle: Laser Zentrum Hannover e.V. NASA's InSight Mars lander has just undergone nearly two weeks of thermal vacuum testing that mimics the brutal environment of space. 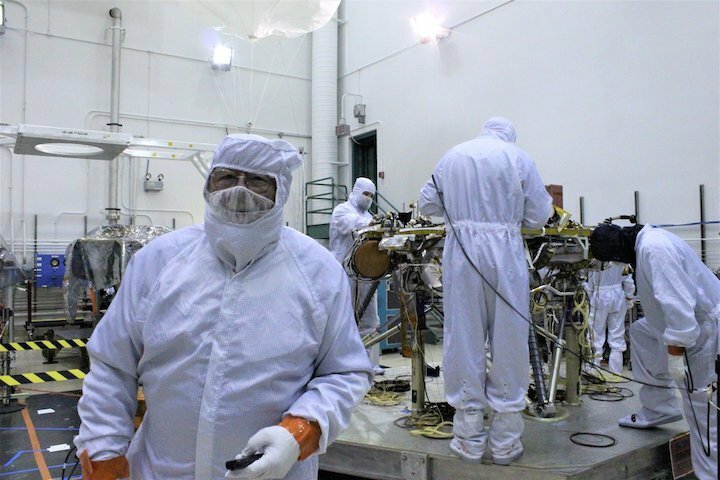 LITTLETON, Colo. — NASA's next Mars lander just passed a big test ahead of its planned May 2018 launch. The spacecraft, known as InSight (short for "Interior Exploration using Seismic Investigations, Geodesy and Heat Transport"), has just completed "thermal vac" testing here at a facility owned by its builder, Lockheed Martin Space Systems Co. Thermal vacuum testing (TVAC) simulates the harsh environment of space to appraise how the Mars-bound craft and its instruments operate under flight-like conditions. 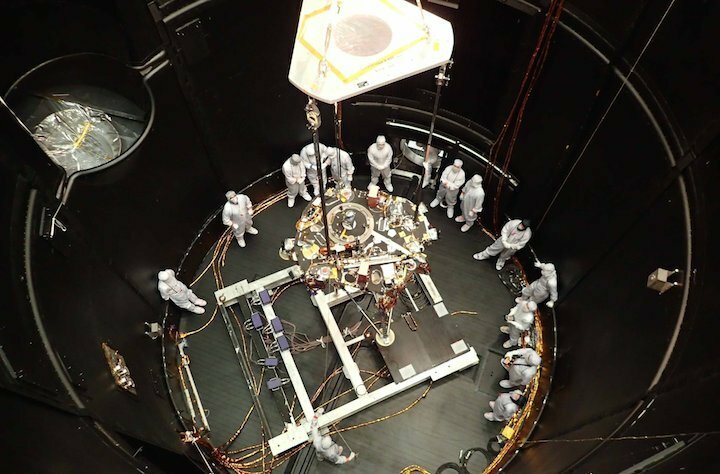 "Almost a two-week-long test, thermal vacuum testing is the most comprehensive and stressing test you can perform on a fully assembled spacecraft prior to its launch," said Scott Daniels, InSight assembly, test and launch operations (ATLO) manager at Lockheed Martin. "With InSight coming out of TVAC, the team has successfully completed the environmental testing phase and will now be finalizing launch preparations over the coming months," Daniels told Space.com. Space.com's Leonard David — suited up, complete with a beard mask — on the floor with NASA's Mars-bound InSight spacecraft. InSight will explore deep below the Martian surface, taking the Red Planet's vital signs — its "pulse" and temperature. If all goes according to plan, the craft should live up to its name, yielding insights about the planet's structure and formation. The mission's data should also be useful for future human explorers on the Red Planet, NASA officials have said. InSight is scheduled to ship out to California in late February, Daniels said. The probe is due to launch atop a United Launch Alliance Atlas V rocket from Vandenberg Air Force Base, during a 30-day window that opens May 5. The scheduled arrival date on the Red Planet is Nov. 26, 2018, with the three-legged lander making a touchdown within a flat stretch of western Elysium Planitia, near the Martian equator. InSight's scheduled mission lifetime is one Mars year — roughly two Earth years — and perhaps longer, depending on vehicle health and NASA funding. 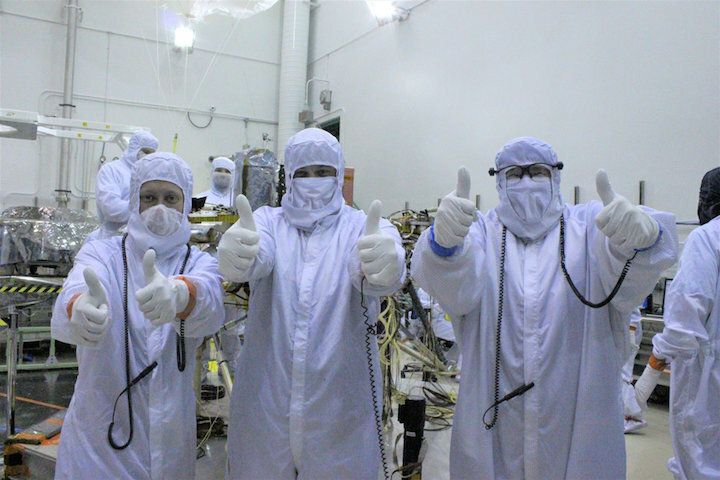 Technicians give NASA's Insight Mars lander a thumbs-up during a final round of testing at Lockheed Martin Space Systems Co. in Colorado. InSight is due to launch toward the Red Planet next year. This won't be InSight's first trip to California. In late 2015, the Mars lander was at its launch site only to have a no-go edict scuttle its takeoff. 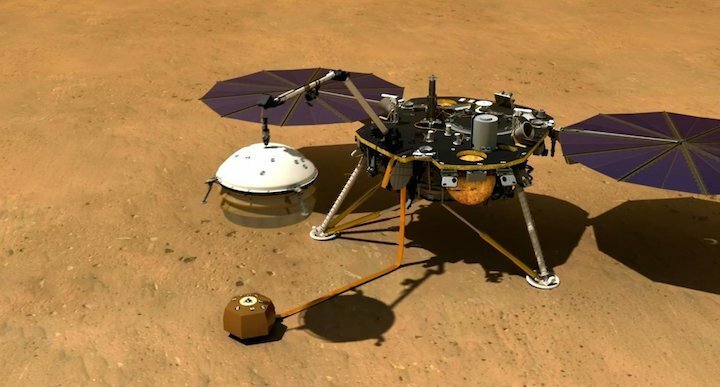 The cause was a leak in the vacuum chamber surrounding one of InSight's two main instruments, the Seismic Experiment for Interior Structure (SEIS), a suite of ultraprecise seismometers provided by the French space agency, CNES. SEIS can gauge "Marsquakes" and other internal activity to better understand the Red Planet's history and structure. SEIS and InSight's other major instrument — the Heat Flow and Physical Properties Package (HP3), which was provided by the German Aerospace Center (known by its German acronym, DLR) — will be deployed after landing by the craft's robotic arm. SEIS is an extremely sensitive instrument; blustery breezes on Mars can create noise that interferes with the detection of seismic signals. Therefore, this device will be crowned by a shield to prevent wind gusts and temperature swings on Mars from influencing its insightful work. Stuart Spath, Lockheed Martin's director of deep-space exploration and InSight manager. HP3 is built to burrow. The instrument will hammer itself down some 16 feet (5 meters) into the Martian subsurface to probe the planet's thermal history. Testing of this mole approach shows HP3 should be able to penetrate loosely bound soils, sand or regolith with a range of grain sizes (but not hard intact rock). "We've mapped the topography of Mars, the geology, and we have a good characterization of the planet's atmosphere, ionosphere and exosphere," said InSight principal investigator Bruce Banerdt, of NASA's Jet Propulsion Laboratory (JPL) in Pasadena, California. "The deep interior of Mars was sort of the last piece in that puzzle." 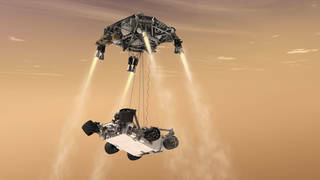 In this artist's illustration, the InSight Mars lander's robotic arm has deployed the Seismic Experiment for Interior Structure (SEIS) on the Red Planet. That device is then crowned by a wind and thermal shield, as shown, to thwart wind gusts and the temperature swings on Mars. The robot arm is also used to deploy the Heat Flow and Physical Properties Package (HP3) science instrument. InSight will touch down at a spot that's among the smoothest surfaces ever investigated for landing spacecraft on Mars — "just a bland, normal place," Banerdt said. InSight is perhaps the first Mars mission for which the landing site isn't really tied to scientific objectives, he added. That's a consequence of the lander's focus on the Martian interior. Once down on the planet, InSight will rest on unconsolidated regolith and quietly listen with its instruments for the tiny vibrations of Marsquakes and also sense small increases in temperature with depth. Though InSight is not devoted to gathering data for human missions, the lander can nevertheless aid in the planning of future crewed efforts, Banerdt said. "Both meteorite impacts and Marsquakes are potential hazards for human habitation on Mars, and InSight will do a good job of characterizing both of these. It's probably not the highest worry for a prospective astronaut but certainly something you should know before you go," he said. "We hope to see on the order of a dozen impacts during the period of our mission, most rather small and within a few hundred kilometers, but we can detect something that makes a 10-meter [33 feet] crater out to over 1,000 kilometers [620 miles]," Banerdt added. The seismic signals from such impacts have a characteristic fingerprint: "We know this from Apollo, which saw thousands of impacts on the moon," he said. The hope is to find new craters in "after" images snapped by NASA's Mars Reconnaissance Orbiter (MRO). There is already near-complete coverage by MRO's Context Camera (CTX) out to over 1,860 miles (3,000 kilometers) from InSight's targeted landing site. "If we can pinpoint the location of the crater/seismic event," Banerdt added, "it gives us a lot more leverage in using the seismogram to give us detailed crustal and upper mantle structure." 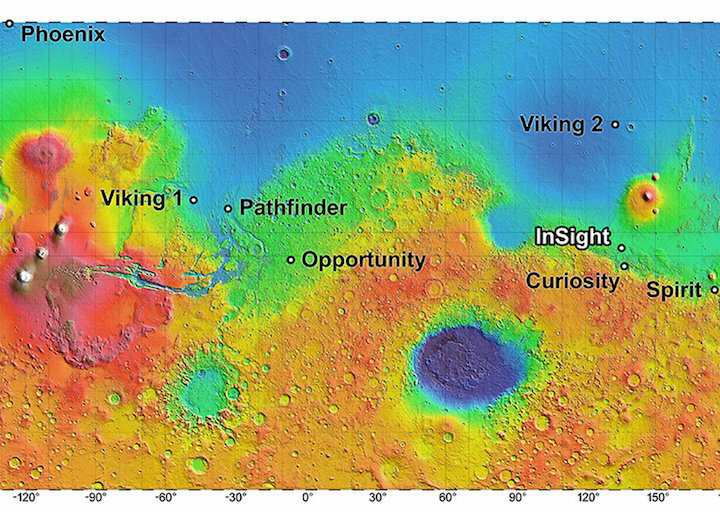 InSight's landing zone is a flat stretch of the western Elysium Planitia, near the Martian equator. InSight looks a lot like NASA's Phoenix Mars lander, which found water ice near the Martian north pole in 2008. This should be no surprise; both spacecraft were built by Lockheed Martin. InSight lands on three legs, each of which has crushable material to absorb impact energy. The individual legs are also equipped with special sensors that signal touchdown once the lander footpad begins to support the weight of the lander on the surface. At that point, all of the descent engines are shut down. Stuart Spath, Lockheed Martin's director of deep-space exploration and InSight manager at the company, said that this propulsive-lander platform could handle other Mars missions as well. "If there are other instruments NASA wants to fly to the Red Planet," he said, "we're happy to provide a lander for them." But propulsive landing is "kind of our method of choice," Spath said.